Rich Yang (847) 778-5986 834 N Rush St Chicago Illinois 60611 ? ? ? ? 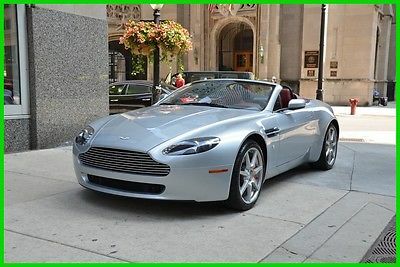 2008 Aston Martin V8 Vantage Vehicle Information VIN: SCFBF04B18GD07848 Stock: 07848 Mileage: 13,279 Color: Silver Trans: A Engine: V8 4.3L MPG: Drivetrain: RWD Contact Bentley Gold Coast 834 N Rush St Chicago Illinois 60611 View Map Ask for:Rich Yang Contact: ?Contact Us Primary Phone:(847) 778-5986 ? ? ?Credit Application ?Directions to Dealer ?Contact Us Options and Standard Features Options ? Abs: 4-Wheel ? Airbag Deactivation: Occupant Sensing Passenger ? Antenna Type: Diversity ? Anti-Theft System: Alarm With Remote ? Auxiliary Audio Input: Ipod/Iphone ? Braking Assist ? Cargo Area Light ? Center Console Trim: Alloy ? Center Console: Front Console With Storage ? Clock ? Convertible Rear Window: Glass ? Convertible Roof: Power ? Cupholders: Front ? Dash Trim: Alloy ? Door Trim: Leather ? Driver Seat Power Adjustments: 10 ? Electronic Brakeforce Distribution ? Emergency Interior Trunk Release ? Floor Mat Material: Carpet ? Floor Mats: Front ? Front Air Conditioning: Automatic Climate Control ? Front Airbags: Dual ? Front Brake Diameter: 14.0 ? Front Brake Type: Ventilated Disc ? Front Headrests: 2 ? Front Seat Type: Sport ? Front Shock Type: Gas ? Front Spring Type: Coil ? Front Stabilizer Bar ? Front Suspension Classification: Independent ? Front Suspension Type: Double Wishbone ? Gauge: Tachometer ? In-Dash Cd: 6 Disc ? Limited Slip Differential: Rear ? Parking Sensors: Rear ? Passenger Seat Power Adjustments: 10 ? Phone: Pre-Wired For Phone ? Power Door Locks ? Power Steering ? Power Windows ? Radio: Am/Fm ? Reading Lights: Front ? Rear Brake Diameter: 13.0 ? Rear Brake Type: Ventilated Disc ? Rear Shock Type: Gas ? Rear Spring Type: Coil ? Rear Stabilizer Bar ? Rear Suspension Classification: Independent ? Rear Suspension Type: Double Wishbone ? Rollover Protection System ? Shift Knob Trim: Leather ? Side Airbags: Front ? Side Mirror Adjustments: Power ? Stability Control ? Steering Wheel Mounted Controls: Audio ? Steering Wheel Trim: Leather ? Steering Wheel: Tilt And Telescopic ? Storage: Door Pockets ? Tire Pressure Monitoring System ? Tire Speed Rating: Z ? Tire Type: Performance ? Traction Control ? Trip Computer ? Upholstery: Leather ? Vanity Mirrors: Dual ? Warnings And Reminders: Low Fuel Level ? Watts: 160 ? Window Defogger: Rear Basic Information Stock Number: 07848 VIN Number: SCFBF04B18GD07848 Style Name: Roadster Make: Aston Martin Model: V8 Vantage Model Year: 2008 Vehicle Type: Exotic Vehicle Trim: Roadster Interior Color: Red Exterior Color: Silver Body Type: Convertible Engine Engine Description: V8 4.3L Fuel Type: Gas Fuel Induction: MPI Valves Per Cylinder: 4 Aspiration: Normal DriveTrain Differential Limited Slip: Mechanical Driven Wheels: Rear-Wheel Transmission: A Wheels Rims: Silver Aluminum Wheels Spare Rim Type: Aluminum Drive Train Type: RWD Suspension Independent Suspension: Four-Wheel Stabilizer Bar: Front And Rear Instrumentation Clock External Temp Tachometer Trip Computer Roof and Glass Convertible Roof: Power Convertible Window: Glass Rear Window Front Wipers: Variable Intermittent Privacy Glass: Light Rear Defogger In Car Entertainment Antenna Type: Window Grid Audio System: AM/FM Stereo Speakers: 6 Seats Drivers Height: Power Drivers Lumbar: Power 2-Way Drivers Power: 8 Passenger Lumbar: Power 2-Way Passenger Power: 4 Seating Capacity: 2 Front Seat Type: Bucket Upholstery: Leather Convenience Center Console: Full With Covered Storage Door Pockets: Driver And Passenger Power Outlets Remote Trunk Release: Power Steering Adjustment: Tilt And Telescopic Steering Power: Speed-Proportional Power Steering Power Mirrors: Power Remote Power Door Locks Windows: Power Windows Comfort Air Conditioning: Automatic Air Filtration: Interior Air Filtration Center Console Trim: Aluminum Dash Trim: Aluminum Door Trim: Aluminum Mats: Carpet Front Reading Lights: Front Shift Knob: Leather Steering Wheel Trim: Leather Features Bumpers: Body-Colored Door Reinforcement: Side-Impact Door Beam Safety Turning Circle: 36.6 ABS: 4-Wheel Anti Theft System Brake Assist: Braking Assist Engine Immobilizer Front Headrests: Fixed Safety Stability Control Driver and Passenger Airbag Side Airbag Stability Control Door Reinforcement: Side-Impact Door Beam Doors Rear Door Type: Trunk Dimensions Front Leg Room: 42.8 Inches Luggage Capacity: 5 Cu.Ft. Length: 172.5 Inches Width: 73.5 Inches Height: 50.0 Inches Wheelbase: 102.5 Inches Curb Weight: 3,770 Lbs. ? Apply Now Secure Credit Application Applying for a vehicle loan online is one of the quickest and easiest application methods. Our secure application is easy to complete, all you need are a few personal and employment details. Terms Placing a Bid: Your bid constitutes a legally binding contract to purchase this vehicle. Please do not bid if you're not seriously interested or financially able to purchase this vehicle. Please read eBay's User AgreementBentley Gold Coast reserves the right to, Obtain and verify the registered information of all users who bid on this auction. Cancel any and all bids at our discretion, or end the auction early if necessary.Bidders Age: You must be 18 years of age or older to Bid. Special eBay Bid Retraction Rules: Please read eBay's "Retracting a Bid" If you place a bid before the last 12-hour period of the auction: You may retract that bid before that last 12-hour period but only for exceptional circumstances. You will not be allowed to retract that bid during the last 12-hour period of the auction. If you place a bid during the last 12-hour period of the auction: You will be allowed to retract the bid for exceptional circumstances but only if you do so within one hour after placing the bid.Funds & Financing: For help in arranging for a Pre-Approved loan or for any questions please e-mail or phone Rich at (847) 778-5986 prior to bidding. Buyers Inspection: Bentley Gold Coast has done our best to disclose all information known about this vehicle for auction. Bentley Gold Coast welcomes a buyers inspection. If you plan to have a buyers inspection, please make sure you inspect the vehicle prior to the auction ending. Inspection fees if any are Buyers responsibility. Representations and Warranties made by seller: This vehicle is being sold "as is". Manufacturer's warranties may still apply. Extended warranty may be available, e-mail or phone Rich at (847) 778-5986 for details. No representations or warranties are made by seller, nor are any representations or warranties relied upon by bidders in making bids. Taxes and Registration fees: Out of state buyers are responsible for all state, county, city taxes and fees, as well as title service fees in the state that the vehicle will be registered. All taxes and fees must be paid in full in order for vehicle to be titled and registered. Title Information: Vehicles titles may be held by banks or lenders as collateral for loans. In many cases there is a delay in receiving the original instruments up to 21 days from the time we pay a vehicle off. While we usually have all titles in our possession at closing, there are occasions where we may be waiting for them to arrive. If payment is made by cashier's or personal checks we will hold all titles for 10 days or until funds have cleared. Shipping & Delivery: All shipping charges are buyer's responsibility. Bentley Gold Coast will help with shipping arrangements but will not be responsible in any way for claims arising from shipping damage!Licensed Carriers are generally insured for $3,000,000.00. We assume no responsibility for damages incurred after the vehicle leaves our showroom. All shipping arrangements are provided by Bentley Gold Coast as a courtesy. We are not affiliated with any carrier. Any claims or other communication regarding shipment of vehicles will be between you and the shipper, not with Bentley Gold Coast. The amount of time it takes for delivery is dependent on the carrier, but is generally 7-14 days from the date the vehicle is picked up from our facility until it is delivered to your destination. Verify with the shipper for an Estimate Time of Arrival to be sure. Finalizing your Purchase: Bentley Gold Coast will contact the successful high bidder by e-mail after the auction closes. Successful high bidder MUST communicate with Rich at Bentley Gold Coast by e-mail or phone (847) 778-5986 within 24 hours of the auction ending to make arrangements to complete their transaction. If we cannot confirm your intention to buy or the sale is not completed within 5 days, we reserve the right to relist this vehicle or sell to any other qualified buyer. In order to secure bid on vehicle, Successful bidder (BUYER) must within 24 hours of bid closing send to Seller a Deposit in the amount of 10% by major credit card, cash in person or bank certified funds. Within 72 hours of bid closing, Buyer must send balance of funds by bank wire transfer, cash in person, bank certified funds to Seller. At time of sending initial deposit, Buyer MUST fax copy of their State issued valid Driver License. Furthermore, before said vehicle is released for shipment to Buyer, all other Sale related and title related paperwork must be signed and returned complete to Seller.Fees There are 3 other fees associated with the transaction. Doc fee $168.43 ,$30.00 out of state drive-away tag and $50 for UPS Overnight (to and from) for the docs. Copyright © 2016 Auction123 - All rights reserved. - Disclaimer +- Auction123 (a service and listing/software company) and the Seller has done his/her best to disclose the equipment/condition of this vehicle/purchase. However, Auction123 disclaims any warranty as to the accuracy or to the working condition of the vehicle/equipment listed. The purchaser or prospective purchaser should verify with the Seller the accuracy of all the information listed within this ad. Selling a Vehicle? Create Professional Listings Fast and Easy. Click Here! This Special Edition DBS is Breathe taking. The interior is leather ,suede, and sting ray skin . The car needs no introduction!!!! 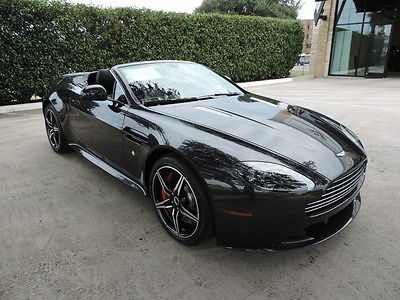 There was a minor accident listed on the car fax report apparently the owner hit a parked car.Information:2010 ASTON MARTIN DBSVIN: SCFFDCCD6AGE12001CONVERTIBLE6.0L V12 FI 48VGASOLINEREAR WHEEL DRIVEStandard Equipment | Safety OptionsAccident / Damage reported3 Previous owners20 Service history recordsPersonal vehicleLast owned in New Jersey8,000 Last reported odometer readingThis CARFAX Vehicle History Report is based only on information supplied to CARFAX and available as of 12/19/16 at 8:41:33 AM (EST). Other information about this vehicle, including problems, may not have been reported to CARFAX. Use this report as one important tool, along with a vehicle inspection and test drive, to make a better decision about your next used car.Ownership HistoryThe number of owners is estimated Owner 1 Owner 2 Owner 3Year purchased2010 2012 2014 Type of ownerPersonalPersonalPersonalEstimated length of ownership1 yr. 10 mo. 1 yr. 5 mo. 2 yrs. 5 mo. Owned in the following states/provincesFlorida Florida Florida, New Jersey Estimated miles driven per year2,591/yr 864/yr --- Last reported odometer reading4,774 6,365 8,000 Title HistoryCARFAX guarantees the information in this section Owner 1 Owner 2 Owner 3Salvage | Junk | Rebuilt | Fire | Flood | Hail | LemonGuaranteedNo ProblemGuaranteedNo ProblemGuaranteedNo ProblemNot Actual Mileage | Exceeds Mechanical LimitsGuaranteedNo ProblemGuaranteedNo ProblemGuaranteedNo ProblemGUARANTEED - None of these major title problems were reported by a state Department of Motor Vehicles (DMV). If you find that any of these title problems were reported by a DMV and not included in this report, CARFAX will buy this vehicle back.Register | View Terms | View CertificateAdditional HistoryNot all accidents / issues are reported to CARFAX Owner 1 Owner 2 Owner 3Total LossNo total loss reported to CARFAX.No Issues ReportedNo Issues ReportedNo Issues ReportedStructural DamageNo structural damage reported to CARFAX.No Issues ReportedNo Issues ReportedNo Issues ReportedAirbag DeploymentNo airbag deployment reported to CARFAX.No Issues ReportedNo Issues ReportedNo Issues ReportedOdometer CheckNo indication of an odometer rollback.No Issues IndicatedNo Issues IndicatedNo Issues IndicatedAccident / DamageAccident reported on 12/04/2012. Inspection on 11/26/2013 found prior damage.No Issues ReportedAccident ReportedNo New Issues ReportedManufacturer RecallCheck with an authorized Aston Martin dealer for any open recalls.Ask YourDealerAsk YourDealerAsk YourDealerBasic WarrantyOriginal warranty estimated to have expired. Interested in an extended warranty?WarrantyExpiredWarrantyExpiredWarrantyExpiredView vehicles with free CARFAX Reports within miles of Please enter a 5-digit US zip code Cars with no accidents 1-Owner Cars Cars with service records Personal/Lease Only(no fleet, rental, commercial)Show Me Now Glossary Detailed HistoryOwner 1Purchased:2010Type:PersonalWhere:FloridaEst. miles/year:2,591/yrEst. length owned:4/29/10 -2/29/12(1 yr. 10 mo. )Low mileage! This owner drove less than the industry average of 15,000 miles per year.Date:Mileage:Source:Comments:04/13/2010 US CustomsVehicle exported fromUnited Kingdomand imported toBrunswick, GA04/29/2010 92 Palm Beach Motor Cars West Palm Beach, FL 561-659-6206 palmbeachmotorcars.comPre-delivery inspection completed04/29/2010 Jaguar Palm Beach West Palm Beach, FL 561-659-6206 jaguarpalmbeach.comVehicle sold04/29/2010 111 Florida Motor Vehicle Dept. Palm Beach, FL Title #0104222412Vehicle purchase reportedTitle issued or updatedRegistration issued or renewedTitle or registration issuedFirst owner reportedTitled or registered aspersonal vehicleVehicle color noted as Silver05/25/2010 571 Palm Beach Motor Cars West Palm Beach, FL 561-659-6206 palmbeachmotorcars.comVehicle serviced08/24/2010 1,876 Palm Beach Motor Cars West Palm Beach, FL 561-659-6206 palmbeachmotorcars.comVehicle serviced09/09/2010 1,956 Palm Beach Motor Cars West Palm Beach, FL 561-659-6206 palmbeachmotorcars.comVehicle serviced10/31/2010 Florida Motor Vehicle Dept. Palm Beach, FL Title #0104222412Registration issued or renewedTitled or registered aspersonal vehicleVehicle color noted as Silver03/25/2011 3,009 Palm Beach Motor Cars West Palm Beach, FL 561-659-6206 palmbeachmotorcars.comVehicle serviced05/11/2011 3,149 Palm Beach Motor Cars West Palm Beach, FL 561-659-6206 palmbeachmotorcars.comMaintenance inspection completedRecommended maintenance performed10,000 mile service performed09/07/2011 3,922 Palm Beach Motor Cars West Palm Beach, FL 561-659-6206 palmbeachmotorcars.comVehicle serviced09/29/2011 Florida Motor Vehicle Dept. Palm Beach, FL Title #0104222412Registration issued or renewedTitled or registered aspersonal vehicleVehicle color noted as Silver10/19/2011 4,028 Palm Beach Motor Cars West Palm Beach, FL 561-659-6206 palmbeachmotorcars.comVehicle serviced12/22/2011 4,391 Palm Beach Motor Cars West Palm Beach, FL 561-659-6206 palmbeachmotorcars.comVehicle serviced02/23/2012 Audi West Palm Beach West Palm Beach, FL 877-733-1222 bramanaudi.comTire(s) replaced02/29/2012 4,761 Braman Motorcars of Palm Beach West Palm Beach, FL 561-684-6666 bramanbmwwpb.comPre-delivery inspection completed02/29/2012 4,765 Braman Motorcars of Palm Beach West Palm Beach, FL 561-684-6666 bramanmc.comVehicle offered for sale03/05/2012 4,774 Auto Auction FloridaListed as a dealer vehicleVehicle sold at auctionMillions of used vehicles are bought and sold at auction every year.03/09/2012 Dealer InventoryVehicle offered for sale03/13/2012 Orlando Infiniti Orlando, FL 407-660-0077 orlandoinfiniti.comVehicle serviced06/09/2012 Orlando Infiniti Orlando, FL 407-660-0077 orlandoinfiniti.comVehicle sold Owner 2Purchased:2012Type:PersonalWhere:FloridaEst. miles/year:864/yrEst. length owned:6/9/12 -11/11/13(1 yr. 5 mo. )Low mileage! This owner drove less than the industry average of 15,000 miles per year.Date:Mileage:Source:Comments:06/09/2012 4,794 Florida Motor Vehicle Dept. Palm Coast, FL Title #0104222412Vehicle purchase reportedRegistration issued or renewedTitled or registered aspersonal vehicleVehicle color noted as Silver06/21/2012 Florida Motor Vehicle Dept. Palm Coast, FL Title #0104222412Title issued or updatedNew owner reportedTitled or registered aspersonal vehicleVehicle color noted as Silver12/04/2012 Florida Damage ReportAccident reportedInvolving front impactIt hit a parked motor vehicleLeft rear primarily damagedDisabling damage reportedVehicle towed01/19/2013 Florida Motor Vehicle Dept. Palm Coast, FL Title #0104222412Registration issued or renewedTitled or registered aspersonal vehicleVehicle color noted as Silver05/06/2013 5,469 Orlando Infiniti Orlando, FL 407-660-0077 orlandoinfiniti.comBattery/charging system checked05/24/2013 5,479 Orlando Infiniti Orlando, FL 407-660-0077 orlandoinfiniti.comVehicle serviced06/13/2013 5,658 Orlando Infiniti Orlando, FL 407-660-0077 orlandoinfiniti.comVehicle serviced10/24/2013 6,042 Orlando Infiniti Orlando, FL 407-660-0077 orlandoinfiniti.comWashed/detailed11/11/2013 Orlando Infiniti Orlando, FL 407-660-0077 orlandoinfiniti.comVehicle offered for sale11/21/2013 6,049 Orlando Infiniti Orlando, FL 407-660-0077 orlandoinfiniti.comVehicle serviced11/26/2013 TrueFrame Inspection Report trueframereport.comVehicle inspected for prior damageVehicle meets TrueFrame Structural StandardsRepairs found to: left side, right side,front-end, rear-endView the complete TrueFrame Report02/06/2014 6,320 Orlando Infiniti Orlando, FL 407-660-0077 orlandoinfiniti.comVehicle serviced02/17/2014 6,325 Orlando Infiniti Orlando, FL 407-660-0077 orlandoinfiniti.comVehicle serviced03/07/2014 6,365 Orlando Infiniti Orlando, FL 407-660-0077 orlandoinfiniti.comVehicle serviced03/07/2014 Florida Motor Vehicle Dept. Lake Mary, FL Title #0104222412Vehicle purchase reportedRegistration issued or renewedVehicle color noted as Gray03/11/2014 Warrantech Automotive, Inc. Longwood, FL warrantech.comService contract issued Owner 3Purchased:2014Type:PersonalWhere:Florida, New JerseyEst. length owned:6/9/14 -11/21/16(2 yrs. 5 mo. )Date:Mileage:Source:Comments:06/09/2014 Florida Motor Vehicle Dept. Lake Mary, FL Title #0104222412Title issued or updatedRegistration issued or renewedNew owner reportedTitled or registered aspersonal vehicleVehicle color noted as Silver10/12/2016 6,945 New Jersey Motor Vehicle Dept. Hackettstown, NJ Title #SV20162860160Title issued or updatedDealer took title of this vehiclewhile it was in inventoryVehicle color noted as Gray11/21/2016 7,565 Auto Auction FloridaListed as a dealer vehicleVehicle sold at auction12/15/2016 8,000 Dealer InventoryVehicle offered for salePrint this CARFAX Report and take it to your pre-purchase inspection Have Questions? Please visit our Help Center at www.carfax.com.View Full Glossary GlossaryAccident / Damage IndicatorCARFAX receives information about accidents in all 50 states, the District of Columbia and Canada. Different information in a vehicle's history can indicate an accident or damage, such as: salvage auction, fire damage, police-reported accident, crash test vehicle, damage disclosure, collision repair facility and automotive recycler records. Not every accident or damage event is reported and not all reported are provided to CARFAX. Details about the accident or damage event when reported to CARFAX (e.g. severity, impact location, airbag deployment) are included on the Vehicle History Report. CARFAX recommends you obtain a vehicle inspection from your dealer or an independent mechanic.According to the National Safety Council, Injury Facts, 2015 edition, 8% of the 254 million registered vehicles in the U.S. were involved in an accident in 2013. Over 74% of these were considered minor or moderate.CARFAX depends on many sources for its accident / damage data. CARFAX can only report what is in our database on 12/19/16 at 8:41:33 AM (EST). New data will result in a change to this report.Florida Damage Reports:Provide an estimate of the extent of damage in its accident reports for the following:SEVERE/TOTALED: The vehicle cannot be driven from the accident scene due to severe damage or an injury. This level of damage often results in a Salvage or Junk title.DISABLED: The vehicle had to be towed or hauled away from the accident location.FUNCTIONAL: The vehicle could be driven from the accident location.MODERATE: The accident damage affects the operation of the vehicle and/or its parts. Examples include broken windows, trunk lids, doors, bumpers and tires.MINOR: The accident damage does not affect the operation of the vehicle. Examples include dented bumpers, fenders, grills and body panels. This level of accident should not compromise vehicle safety.NO DAMAGE: The vehicle was not damaged.Are required if the estimated damage exceeds $500First OwnerWhen the first owner(s) obtains a title from a Department of Motor Vehicles as proof of ownership.New Owner ReportedWhen a vehicle is sold to a new owner, the Title must be transferred to the new owner(s) at a Department of Motor Vehicles.Ownership HistoryCARFAX defines an owner as an individual or business that possesses and uses a vehicle. Not all title transactions represent changes in ownership. To provide estimated number of owners, CARFAX proprietary technology analyzes all the events in a vehicle history. Estimated ownership is available for vehicles manufactured after 1991 and titled solely in the US including Puerto Rico. Dealers sometimes opt to take ownership of a vehicle and are required to in the following states: Maine, Massachusetts, New Jersey, Ohio, Oklahoma, Pennsylvania and South Dakota. Please consider this as you review a vehicle's estimated ownership history.Title IssuedA state issues a title to provide a vehicle owner with proof of ownership. Each title has a unique number. Each title or registration record on a CARFAX report does not necessarily indicate a change in ownership. In Canada, a registration and bill of sale are used as proof of ownership.Follow Us: facebook.com/CARFAX @CarfaxReports CARFAX on Google+CARFAX DEPENDS ON ITS SOURCES FOR THE ACCURACY AND RELIABILITY OF ITS INFORMATION. THEREFORE, NO RESPONSIBILITY IS ASSUMED BY CARFAX OR ITS AGENTS FOR ERRORS OR OMISSIONS IN THIS REPORT. CARFAX FURTHER EXPRESSLY DISCLAIMS ALL WARRANTIES, EXPRESS OR IMPLIED, INCLUDING ANY IMPLIED WARRANTIES OF MERCHANTABILITY OR FITNESS FOR A PARTICULAR PURPOSE. CARFAX®© 2016 CARFAX, Inc., a unit of IHS Inc. All rights reserved.Covered by United States Patent Nos. 7,113,853; 7,778,841; 7,596,512, 8,600,823; 8,595,079; 8,606,648; 7,505,838.12/19/16 8:41:33 AM (EST)parked car no airbags were deployed the car is beautiful you can not see any signs of it being fixed I'm attaching the car fax report that is the only information I have about the accident. 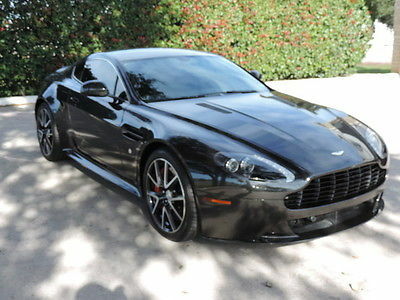 Photo Viewer 2014 Aston Martin Vantage S Coupe ASK SELLER QUESTION Vital Information Year Make Model Mileage Engine 2014 Aston Martin Vantage S Coupe 11,596 430 HP DOHC High Output V8 Exterior Interior Stock# VIN Ceramic Gray Metalic Obsidian Black #J0E01 SCFEBBDL0EGC17972 view window sticker Carfax Highlights View Carfax Report Not all accidents or other issues are reported to CARFAX. The number of owners is estimated. See the full CARFAX Report for additional information and glossary of terms. Carfax Highlights No Accidents / Damage Reported to CARFAXNo Airbag Deployment Reported to CARFAXVehicle Qualifies for the CARFAX Buyback GuaranteeNo Structural/Frame Damage Reported to CARFAXNo Manufacturer Recalls Reported to CARFAXNo Indication of an Odometer RollbackCARFAX 1-OwnerNo Total Loss Reported to CARFAX View All Photos Description 2014 Aston Martin Vantage S Coupe Extremly nice Vantage S Coupe One Owner, Special Ordered and maintained by Aston Martin of Austin. This is a one of a kind Vantage S!! The color is one of the most Brilliant Metallics ever finished on a Road going Motorcar! Well optioned with practically every item available. The wheels were Color Matched to the Body so take a real close look at the detail added to this beautiful Sports Coupe! Factory warranty through 8-27-2016 with unlimited mileage. Such a great buy! Call today! 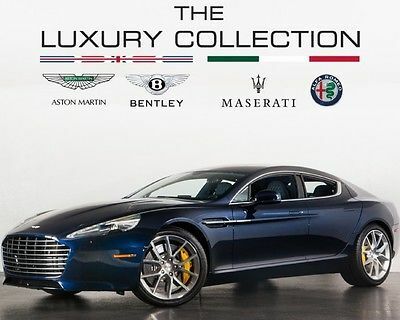 512-401-2663 Contact Us Dealer Contact Aston, Bentley, Lotus of Austin Carfax Secure Online Credit Application Applying for a vehicle loan online is one of the quickest and easiest application methods. Our secure online application form is easy to complete, all you need are a few personal and employment details. Get started now. Late European is a locally operated Austin Texas USA dealership representing Aston Martin, Bentley, Lotus and Rolls-Royce fine automobiles. Owners Ava and Steve Late are long time Austinites with over 50 years of automotive experience. TERMS & CONDITIONS EUROAUSTIN1007 is a registered eBay user name of . is a Texas Dealer operating under Texas License number is located at 12989 Research Blvd Austin, TX78750. 's office can be reached at 512.401.2663 AT AUCTION CLOSE Successful "winning" bidder must telephone 512.401.2663 within 24 hours after the auction has ended to verify purchase and make arrangements to complete the transaction. Within (4) business days of the end of auction, full payment must be received either by cashiers-check, approved bank draft, or certified funds. If funds are not received, and an alternate arrangement has not been made, the vehicle can and will be made available to other potential buyers on a first-come, first-serve basis. OUR GUARANTEE We have disclosed as much information as possible about this vehicle and aim to only carry quality pre-owned merchandise. recommends all vehicles be inspected BEFORE leaving our facility. If upon personal and/or authorized professional inspection of the eBay purchased vehicle at our facility, buyer finds a substantial discrepancy between the published report and actual vehicle, we will either correct the problem at no charge, or work out a compromise, or refund all monies paid. Buyer will not be responsible for any eBay related fees and will be dismissed from any contractual obligation with eBay to purchase the vehicle if and only if inspection proves vastly different from published advertisement. SHIPPING - TRANSPORT OF VEHICLE Returns are allowed in the event the vehicle is shipped and you are dissatisfied. However, a 10% restocking fee applies and the return must take place within 7 days from receipt and the vehicle must have fewer than 200 miles difference upon return. Return shipping fees are the obligation of the buyer. values your business! We want you to be completely satisfied with your online automotive experience from purchase to delivery. Please understand that will arrange shipping for you as a value added service only. We are NOT the shipping company. All shipping questions and/or concerns should be addressed directly with the shipping company used to transport said vehicle. Should you be unsatisfied with your shipping service, please let us know! We aim to recommend only quality vendors. ACCEPTED FORMS OF PAYMENT accepts cashiers’ checks, certified funds, or verified drafts from known/approved financial institutions. We also accept payment from online lenders Capital One Auto Finance, and eBay Finance. All buyers pay a $100.00 administrative fee plus a $50.00 documentary fee. Texas buyers must pay 6.25% sales tax plus applicable Texas fees. Out-of-state buyers are responsible for their own taxes, registration, etc. in their own states. DISCLAIMER All vehicles are sold "as-is" and without warranty. Some vehicles will have factory warranty remaining (will be stated in our description). All cars come with one master key unless otherwise stated. Vehicles come with books and/or manuals only if pictured in photo gallery and/or if stated in the advertisement. * We make every effort to present information that is accurate. However, it is based on data provided by the vehicle VIN decoding and/or other sources and therefore exact configuration, color, specifications & accessories should be used as a guide only and are not guaranteed. Under no circumstances will we be liable for any inaccuracies, claims or losses of any nature. Furthermore, inventory is subject to prior sale and prices are subject to change without notice. Prices do not include taxes, registration fees, finance and/or documentation charges, or shipping fees. To ensure your complete satisfaction, please verify accuracy prior to purchase. ** also offers and recommends affordable extended warranties, please call us for more details. ** Online Bidders are entering into a legal and binding contract to purchase the vehicle described above. If you do not intend to purchase this item, DO NOT BID! Ad created by eCarList.com. Call 214-722-8200 to find out how eCarList can service your dealership. 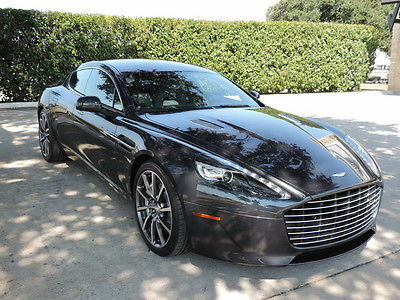 2015 Aston Martin Rapide S Vital Information Year Make Model Mileage Engine 2015 Aston Martin Rapide S 798 6.0L 12 Cylinder Engine Exterior Interior Stock# VIN MIDNIGHT ALL BALTIC BLUE AM004 SCFHMDBS2FGF04664 Photos Description 2015 Aston Martin Rapide S Exterior Colour: Midnight Blue Upper Instrument Panel: Baltic Blue Trim Upper Colour: Baltic Blue Trim Upper Stitching: Cream Truffle Trim Lower Colour: Baltic Blue Trim Lower Stitching: Cream Truffle Seat Outer Colour: Baltic Blue Seat Outer Stitching: Cream Truffle Seat Inner Colour: Baltic Blue Seat Inner Stitching: Cream Truffle Seat Accent Colour: Baltic Blue Seat Accent Quilting Stitch: Cream Truffle Embroidery Driver Seat: Cream Truffle Embroidery Passenger Seat: Cream Truffle Headlining Feature Colour: Arctic Blue Headlining Quilt Stitch: Match To Headlining Feature Carpet Colour: Caspian Blue Carpet Binding: Dark Knight Leather Parcel Shelf Feature Colour: Arctic Blue Parcel Shelf Quilt Stitch: Match To Headlining Feature Steering Wheel Colour: Obsidian Black Brake Calipers: Brake Calipers - Yellow Fascia Trim: Carbon Fibre Veneer First Aid Kit: First Aid Kit Keyfob: Second Glass Key Keyfob Cover: Leather Ecu Pouch Paddleshifts: Carbon Fibre Paddles Seat Cooling: Ventilated Seats Seat Embroidery Pattern: Headrest Embroidery - Aston Martin Wings Seat Type: Sports Seat Seatbelt: Seatbelts - Warm Charcoal Seating Arrangement: 4 Seats Wheels: 20Inch 10 Spoke Silver Dt Wheels Contact Us Dealer Contact Luxury Motor Cars, Ltd Standard Equipment ENTERTAINMENT Bluetooth Wireless Phone Connectivity Radio: AM/FM w/CD/MP3 Player -inc: satellite radio and color screen 15 Bang & Olufsen Speakers 1000w Premium Amplifier Window Grid Antenna Radio w/Clock and Speed Compensated Volume Control 1 LCD Monitor In The Front Radio w/MP3 Player, Clock, Speed Compensated Volume Control, Aux Audio Input Jack and External Memory Control Automatic Equalizer Digital Signal Processor Wireless Streaming EXTERIOR Aluminum Grille Body-Colored Front Bumper Composite/Aluminum Panels Lip Spoiler LED Brakelights Body-Colored Power Heated Side Mirrors w/Power Folding Trunk Rear Cargo Access Fully Automatic Projector Beam High Intensity Low/High Beam Auto-Leveling Headlamps w/Washer and Delay-Off Clearcoat Paint Speed Sensitive Rain Detecting Variable Intermittent Wipers Tires: P245/40R20 Front & P295/35R20 Rear -inc: Bridgestone Potenza Aluminum Bodyside Moldings Compact Spare Tire Mounted Inside Body-Colored Rear Bumper Light Tinted Glass Tailgate/Rear Door Lock Included w/Power Door Locks Laminated Glass Aluminum Side Windows Trim Rear Fog Lamps Wheels: 20" Multi-Spoke Silver Alloy -inc: Diamond-turned finish Body-Colored Door Handles Fixed Rear Window w/Defroster Aluminum Spare Wheel INTERIOR Sport Front Seats w/Power 2-Way Driver Lumbar Driver Foot Rest Rear HVAC w/Separate Controls Gauges -inc: Speedometer, Odometer, Engine Coolant Temp, Tachometer, Trip Odometer and Trip Computer Leather Steering Wheel Front Cupholder Front And Rear Map Lights Cargo Features -inc: Cargo Partition Fixed Front Head Restraints and Fixed Rear Head Restraints Full Alcantara Simulated Suede Headliner Cargo Space Lights Cruise Control w/Steering Wheel Controls 8-Way Power Passenger Seat -inc: Power Recline, Height Adjustment, Fore/Aft Movement, Cushion Tilt and Power 2-Way Lumbar Support Day-Night Auto-Dimming Rearview Mirror Trip Computer Full Floor Console w/Covered Storage, Rear Console w/Storage and 1 12V DC Power Outlet Fade-To-Off Interior Lighting Rear Cupholder Carpet Floor Trim and Carpet Trunk Lid/Rear Cargo Door Trim 4 Person Seating Capacity Leather Door Trim Insert Remote Keyless Entry w/4 Door Curb/Courtesy, Illuminated Entry and Illuminated Ignition Switch Compass Power Rear Windows Valet Function Analog Display Engine Immobilizer Heated Sport Bucket Seats -inc: 10-way power, memorized height, memorized lumbar and memorized tilt Rigid Cargo Cover Interior Trim -inc: Genuine Wood/Metal-Look Instrument Panel Insert, Metal-Look Door Panel Insert, Leather/Metal-Look Console Insert, Metal-Look Interior Accents and Leather Upholstered Dashboard Front Center Armrest w/Storage FOB Controls -inc: Trunk/Hatch/Tailgate Garage Door Transmitter Power 1st Row Windows HVAC -inc: Console Ducts Automatic Air Conditioning Illuminated Glove Box Memory Settings -inc: Driver And Passenger Seats and Door Mirrors Remote Releases -Inc: Power Trunk/Hatch and Power Fuel Integrated Navigation System Bucket Folding Bucket Front Facing Heated Fold Forward Seatback Rear Seat Redundant Digital Speedometer 2 Seatback Storage Pockets Perimeter Alarm Air Filtration Door Mirrors Driver / Passenger And Rear Door Bins 8-Way Power Driver Seat -inc: Power Recline, Height Adjustment, Fore/Aft Movement, Cushion Tilt and Power 2-Way Lumbar Support Systems Monitor Outside Temp Gauge Full Carpet Floor Covering -inc: Carpet Front And Rear Floor Mats Driver And Passenger Heated-Cushion, Driver And Passenger Heated-Seatback Manual Tilt/Telescoping Steering Column 1 12V DC Power Outlet Power Door Locks w/Autolock Feature MECHANICAL Engine Oil Cooler Automatic w/Driver Control Ride Control Sport Tuned Adaptive Suspension Transmission: Touchtronic III 8-Speed Automatic -inc: electronic shift-by-wire control system Rear-Wheel Drive Dual Stainless Steel Exhaust w/Chrome Tailpipe Finisher Battery w/Run Down Protection Front And Rear Anti-Roll Bars 5313# Gvwr 2.73 Axle Ratio Double Wishbone Rear Suspension w/Coil Springs 4-Wheel Disc Brakes w/4-Wheel ABS, Front And Rear Vented Discs, Brake Assist and Electric Parking Brake Cell Phone Pre-Wiring Double Wishbone Front Suspension w/Coil Springs Engine: 6.0L V12 DOHC Hydraulic Power-Assist Speed-Sensing Steering Transmission w/Driver Selectable Mode and Sequential Shift Control w/Steering Wheel Controls 23.9 Gal. Fuel Tank Bilstein Brand Name Shock Absorbers Mechanical Limited Slip Differential SAFETY Airbag Occupancy Sensor Dual Stage Driver And Passenger Seat-Mounted Side Airbags Front And Rear Parking Sensors Dual Stage Driver And Passenger Front Airbags Electronic Stability Control (ESC) Curtain 1st And 2nd Row Airbags Outboard Front Lap And Shoulder Safety Belts -inc: Pretensioners Tire Specific Low Tire Pressure Warning Rear Child Safety Locks Side Impact Beams ABS And Driveline Traction Control Below are a few of the other vehicles currently available from Luxury Motor Cars, Ltd Terms and Conditions Terms and Conditions 925-maserati is a registered eBay user name of Luxury Motor Cars Ltd is a California Dealer operating under CA License number 83454. Luxury Motor Cars Ltd is located at 2330 N. Main, Walnut Creek, CA 94596. Luxury Motor Cars Ltd 's office can be reached at 925-444-2000 At Auction Close Successful "winning" bidder must telephone 925-444-2000within 24 hours after the auction has ended to verify purchase and make arrangements to complete the transaction. Within (4) business days of the end of auction, full payment must be received either by cashiers-check, approved bank draft, or certified funds. If funds are not received, and an alternate arrangement has not been made, the vehicle can and will be made available to other potential buyers on a first-come, first-serve basis. Our Guarantee We have disclosed as much information as possible about this vehicle and aim to only carry quality pre-owned merchandise. Luxury Motor Cars Ltd recommends all vehicles be inspected BEFORE leaving our facility. If upon personal and/or authorized professional inspection of the eBay purchased vehicle at our facility, buyer finds a substantial discrepancy between the published report and actual vehicle, we will either correct the problem at no charge, or work out a compromise, or refund all monies paid. Buyer will not be responsible for any eBay related fees and will be dismissed from any contractual obligation with eBay to purchase the vehicle if and only if inspection proves vastly different from published ad. Shipping - Transport of Vehicle Returns are allowed in the event the vehicle is shipped and you are dissatisfied. However, a 10% restocking fee applies and the return must take place within 7 days from receipt and the vehicle must have fewer than 200 miles difference upon return. Return shipping fees are the obligation of the buyer. Luxury Motor Cars Ltd values your business! We want you to be completely satisfied with your online automotive experience from purchase to delivery. Please understand that Luxury Motor Cars Ltd will arrange shipping for you as a value added service only. We are NOT the shipping company. All shipping questions and/or concerns should be addressed directly with the shipping company used to transport said vehicle. Should you be unsatisfied with your shipping service, please let us know! We aim to recommend only quality vendors. Accepted Forms of Payment Luxury Motor Cars Ltd accepts cashiers’ checks, certified funds, or verified drafts from known/approved financial institutions. We also accept payment from online lenders Capital One Auto Finance, and eBay Finance. All buyers pay a $100.00 administrative fee plus a $50.00 documentary fee. Vehicle Inventory tax is calculated at 0.18% (that equates to $18.00 per $10,000 spent). CA buyers must pay [8.50%] sales tax plus applicable CA fees. Out-of-state buyers are responsible for their own taxes, registration, etc. in their own states. Ad created by eCarList.com. Call 214-722-8200 to find out how eCarList can service your dealership. 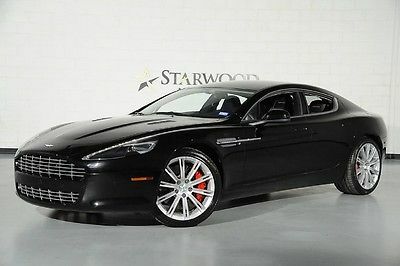 2010 Aston Martin Rapide Vital Information Year Make Model Mileage Engine 2010 Aston Martin Rapide 10,857 6.0L DOHC 48-Valve V12 Engine Exterior Interior Stock# VIN Onyx Black Phantom Grey #4CF00206-2 SCFHDDAJ1AAF00206 view window sticker Carfax Highlights View Carfax Report Not all accidents or other issues are reported to CARFAX. The number of owners is estimated. See the full CARFAX Report for additional information and glossary of terms. Carfax Highlights No Accidents / Damage Reported to CARFAXNo Airbag Deployment Reported to CARFAXVehicle Qualifies for the CARFAX Buyback GuaranteeNo Structural/Frame Damage Reported to CARFAXNo Manufacturer Recalls Reported to CARFAXNo Indication of an Odometer Rollback3 OwnersNo Total Loss Reported to CARFAX Photos Description 2010 Aston Martin Rapide Benny Lane Direct: 469-323-6734 Email: benny@starwoodmotors.com 2010 Aston Martin Rapide Onyx Black over Obsidian leather Interior SUPER NICE, WELL MAINTAINED AND CARED FOR! The photos tell it all! 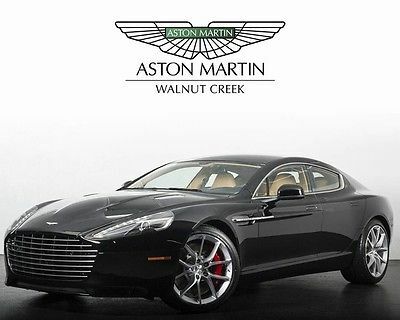 One of the most popular combinations in the Aston Martin Rapide ! Non-Smoker car.Interior and exterior are showroom nice! The 6.0 Litre 12 cylinder Engine delivers 470 HP with 443 lb ft of torque which propels the car 0-60 in only 4.9 seconds! Effortless motion, drive quality, and handles like a dream! Nothing drives like a Aston Martin, NOTHING! In addition this vehicle is equipped Bang & Olufsen Sound Navigation Heated Front Seats Cooled Front Seats Rear Seat Entertainment Alternate color Brake Calipers Obsidian Leather Interior This car is perfect as a daily driver or just as your weekend car. A little about Starwood Motors, We are a full service, licensed dealer in Dallas, TX. We ship worldwide via fully insured carriers. We have financing terms up to 84 months with very competitive rates. We also have leasing options available. We take all trade-ins. Call, email or text me today. Please do not hesitate to contact Benny Lane direct with any further questions or to make arrangements for purchase at...469-323-6734 or Benny@starwoodmotors.com I take trade-ins, offer financing and arrange worldwide shipping as well. Contact Us Dealer Contact Starwood Motors Benny Lane benny@starwoodmotors.com 469-323-6734 Call or email with any questions. Best regards, Davis Speight 214-367-5412 (direct) 214-367-5413 (fax) davis@starwoodmotors.com AutoCheck Carfax Ask Dealer A Question If you have a question, please call or complete the form below for a quick response. Name Email Phone Question(s) --> Standard Equipment ENTERTAINMENT Bluetooth hands-free phone system 1000W Bang & Olufsen BeoSound AM/FM/CD/MP3 stereo system -inc: (15) speakers, acoustic lens technology (ALT), ambient noise compensation EXTERIOR Quad "swan wing" doors Aluminum doors/roof Variable intermittent windshield wipers Body color front/rear bumpers P295/35R20 Bridgestong Potenza rear tires 20" alloy wheels Polished alloy upper/lower grill LED indicators, side lamps & brake lights P245/40R20 Bridgestone Potenza front tires Bi-xenon headlamps INTERIOR Tilt/telescopic adjustable steering column -inc: leather-trimmed magnesium alloy paddle shifters Anti-theft alarm system w/immobilizer Pwr heated front sport bucket seats -inc: double-edge stitching Driver/front passenger visor vanity mirrors Full-grain leather seat trim Dual rear sport bucket seats -inc: one-touch fold-flat capability Rear window defogger Remote keyless entry Front center console -inc: large storage bins between front/rear seats Pwr windows Pwr door locks Front/rear air conditioning Electronic parking brake Glass & polished stainless steel Emotion Control Unit (ECU) engine starting system MECHANICAL 6.0L DOHC 48-valve V12 engine Rear wheel drive 4-wheel double wishbone independent suspension w/coil springs -inc: anti-squat/anti-lift geometry, anti-roll bar 6-speed Touchtronic 2 automatic transmission -inc: electronic shift-by-wire control system, sport mode Pwr 4-wheel dual cast disc brakes Speed-sensitive pwr rack & pinion steering Stainless steel exhaust w/active bypass valves Adaptive damping system (ADS) -inc: sport mode Limited slip differential Alloy torque tube w/carbon fiber drive shaft 3.46 rear axle ratio SAFETY Front/rear seatbelt pretensioners Front/rear parking sensors Driver/front passenger dual stage airbags 2-stage dynamic stability control (DSC) Rear seat ISOFIX child seat attachment points Front/rear crumple zones Passenger air bag sensor Tire pressure monitor system 4-wheel anti-lock braking system (ABS) -inc: hydraulic brake assist (HBA) Front/rear side impact airbags Rear curtain airbags Side impact door beams Secure Online Credit Application Applying for a vehicle loan online is one of the quickest and easiest application methods. Our secure online application form is easy to complete, all you need are a few personal and employment details. Get started now. Other Vehicles Currently Available Starwood Motors With over 30 years of automotive experience, we offer our clients an impeccable service-based car buying experience! We truly care about your complete satisfaction and believe in our mission to find your perfect vehicle. We're based in Dallas, TX but offer our services all over the world, from Dallas to Dubai as we say. Our goal is to find the exact car you want at the price you want! We take great pride in keeping working relationships with franchise dealerships and wholesalers throughout the country so that we're able to accommodate each individual client's needs when it comes to any make or model. Clients also have access to a high-quality online inventory of previously owned cars, available for immediate purchase. Every car that comes through our showroom has been fully reconditioned and meticulously detailed to be like new, just for you. We're really more like personal shoppers who help each client find exactly what they're looking for in every stage of life, whether it's a dream toy or a quality family workhorse like one of our custom Jeeps. We want to leave you with peace of mind when you take a Starwood Motors car home with you, which is why our unique car buying and selling approach is strategically simple. We start with our knowledgeable sales team and end with satisfied clients! It's earned us a trusted track record for excellence. Come by and meet our team to see for yourself. We'd love to meet you, show you what's new and give you a tour of our showroom! We are also a member of the Better Business Bureau: Terms & Conditions Dealer Information Starwood Motors is a Texas Dealer operating under Texas License number P109974. Starwood Motors is located at 4641 Nall Rd., Dallas, TX 75244. The office of Starwood Motors can be reached at (800) 348-9008 or (214) 367-5400. Questions: Please feel free to contact us directly at any time with any questions you may have. Odometer Readings Due to demo test drives and mechanical inspections, the mileage of the vehicle represented might be slightly different than the mileage stated when the vehicle was first listed on eBay. Bidding Your bid constitutes a legally binding contract to purchase this vehicle. Please do not bid if you're not seriously interested or financially able to purchase this vehicle. Please read eBay's "User Agreement". Bidder's Age You must be 18 years of age or older to bid. Bid Retraction Please read eBay's "Retracting a Bid". If you place a bid before the last 12-hour period of the auction, you may retract the bid before the last 12-hour period only for exceptional circumstances. You will not be allowed to retract that bid during the last 12-hour period of the auction. If you place a bid during the last 12-hour period of the auction, you will be allowed to retract the bid for exceptional circumstances only if you do so within one hour after placing the bid. Notice to Bidders We reserve the right to cancel all bids and end the auction early should the vehicle no longer be available for sale. NOTE: All of our eBay inventory is available for sale at our dealership. We will end auctions early should a vehicle be sold at the dealership. Financing For help in arranging financing or for any questions regarding financing options, please contact us prior to bidding. Not being able to arrange financing does not constitute a valid reason for deposit refund. So, be sure financing is in order or approved before placing a deposit on any car. Buyer's Inspection We do our best to disclose all information known about this vehicle for auction. We welcome a Buyer's Inspection. If you plan to have a Buyer's Inspection, please make sure you have the vehicle inspected prior to the end of the auction. Inspection fees, if any, are the "Buyer's" sole responsibility. Warranty Unless stated otherwise, this vehicle is being sold "as is". Manufacturer's warranties may still apply. An extended warranty may also be available. Please contact us for details. No representations or warranties are made by the "Seller", nor are any representations or warranties relied upon by "Bidders" in making bids. Payments We accept Certified and Cashiers Checks and Funding Transfers in $US only. All funding or paperwork must be received as soon as possible and within no more than 5 days of auction closure or we reserve the right to re-list or sell to any other qualified buyer. Winning Bidder must confirm his winning bid with a $2,000 Refundable Deposit within 48 hours of auction end. Balance of Purchase Price is due to Seller within 5 days of the end of the auction. Taxes and Fees "Buyer" is responsible not only for knowing their own states' laws regarding taxes and fees, but also remitting the proper taxes, fees, and documents for their state. All taxes and fees must be paid in full in order for the vehicle to be titled and registered. Texas buyers need only remit state TT&L to us and we would be happy to handle the registration process for you at no additional cost. Starwood Motors also applies a documentary fee and a Texas Vehicle Inventory tax on all sales. Title Information Vehicle titles may be held by banks or lenders as collateral for loans. In many cases there is a delay in receiving the original instruments of up to 21 days from the time we pay a vehicle off. While we usually have all titles in our possession at closing, there are occasions where we may be waiting for them to arrive. Finalizing Your Purchase Winning bidder MUST communicate with us by e-mail or phone within 24 hours of the end of the auction to make arrangements to complete the transaction. If we cannot confirm your intention to buy or the sale is not completed within 2 business days, we reserve the right to re-list this vehicle or sell to any other qualified buyer. Before the vehicle is released for shipment to the "Buyer", all sale-related and title-related paperwork must be signed and returned completed to the "Seller". Shipping and Delivery All shipping charges are the "Buyer's" responsibility. We will help with shipping arrangements but will not be responsible in any way for claims arising from shipping damage! Licensed "Carriers" are generally insured for $500,000. We assume no responsibility for damages incurred after the vehicle leaves our showroom. All shipping arrangements provided by us are strictly a courtesy. We are not affiliated with any carrier. Any claims or other communication regarding shipment of vehicles will be between you and the "Carrier" and not with us. The amount of time it takes for delivery depends upon the "Carrier" selected. A typical experience is 7-14 days from the date the vehicle is picked up from our facility until it is delivered to your destination. Verify with the "Carrier" for an Estimated Time of Arrival to be sure. In the event the vehicle arrives and is not to the satisfaction of the client or Starwood Motors can not make the vehicle satisfactory for whatever reason there is a return policy. Starwood Motors will allow the client to return the vehicle minus a 10% restocking fee. This is only possible if the request is made within 24 hours of receiving the vehicle and the vehicle has been driven less then 50 miles of what it had when it left Starwood Motors. Consumer Rights Consumers can learn about their rights when purchasing a used car by calling the Texas Department of Transportation toll free number at (800) 687-7846. Online Bidders are entering into a legal and binding contract to purchase the vehicle described above. If you do not intend to purchase this item, DO NOT BID! Unqualified Bidding, Unqualified Bidders, Auction Interference, Shill Bidding, or any form of harassment can be subject to legal prosecution. We reserve the right to cancel bids at anytime for any reasonable reason. General Disclaimer Starwood Motors reserves the right to obtain and verify the registered information of all users who bid on this auction, cancel any and all bids at our discretion, or end the auction early if necessary. These vehicles are USED vehicles and are not new. Please expect a certain amount of wear, use, and flaws, as is standard on ANY used car. All used cars including this one may have dings, nicks, chips, scratches and any other marks that are associated with use consistent with age and mileage of the vehicle. Obviously, a car that is 10 years old will show more wear and have more flaws than one that is 2 years old. Despite this we at Starwood Motors pride ourselves on attempting to find the highest quality vehicles available. WE WILL ALWAYS MAKE AN EFFORT TO INFORM OUR CUSTOMERS OF ANY FLAWS WE MAY DISCOVER ON OUR VEHICLES, IF/WHEN WE BECOME AWARE OF THEM. We are always open to third party inspections on all our vehicles and would be happy to arrange for one at the customers expense. Since these vehicles are used, please remember that books, extra keys, remote entry keys, CD cartridges, etc..., do not always remain with vehicles throughout their life and we are not responsible for providing them unless otherwise represented or photographed by us. These items are all replaceable at any local factory dealer and should any customer request we would be happy to assist them in locating/obtaining these additional items for them. The information, products, and services published on this web site may include inaccuracies or typographical errors. Starwood Motors and/or its respective suppliers make no representations about the suitability of the information, products, and services contained on this web site for any purpose. All such information is provided "AS-IS" without warranty of any kind. Starwood Motors and/or its respective suppliers herby disclaim all warranties and conditions with regard to this information, including all implied warranties and conditions of merchantability, fitness for a particular purpose, title and non-infringement. In no event shall Starwood Motors and/or its suppliers be liable for any direct, indirect, punitive, incidental, special or consequential damages arising out of or in any connected with the use of this web site or with any delay or inability to use this web site, or for any information obtained through this web site, or otherwise arising out of the use of this web site, whether based on contract, tort, strict liability or otherwise , even if Starwood Motors or any of its suppliers has been advised of the possibility of damages. Because some states/ jurisdictions do not allow the exclusion or limitation of liability for consequential or incidental damages. The above limitation may not apply to you. Ad created by eCarList.com. Call 214-722-8200 to find out how eCarList can service your dealership. 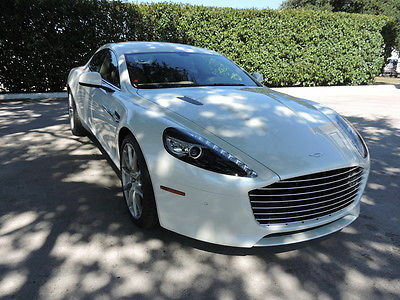 Photo Viewer 2016 Aston Martin Rapide S ASK SELLER QUESTION Vital Information Year Make Model Mileage Engine 2016 Aston Martin Rapide S 29 6.0 DOHC V8 Exterior Interior Stock# VIN Morning Frost Pearl White Metallic Dark Mocha with Bitter Chocolate carpets #A16-09 SCFHMDBS3GGF05081 view window sticker View All Photos Description 2016 Aston Martin Rapide S This could possibly be the rarest and most beautiful 2016 Built to date! Magnificent Morning Frost Pearl White Finish over gorgeous Dark Mocha leather trim in bitter Chocolate. Well optioned with just about everything available. This one of a kind could be yours! Call us! 512-401-2663 Contact Us Dealer Contact Aston, Bentley, Lotus of Austin Secure Online Credit Application Applying for a vehicle loan online is one of the quickest and easiest application methods. Our secure online application form is easy to complete, all you need are a few personal and employment details. Get started now. Late European is a locally operated Austin Texas USA dealership representing Aston Martin, Bentley, Lotus and Rolls-Royce fine automobiles. Owners Ava and Steve Late are long time Austinites with over 50 years of automotive experience. TERMS & CONDITIONS EUROAUSTIN1007 is a registered eBay user name of . is a Texas Dealer operating under Texas License number is located at 12989 Research Blvd Austin, TX78750. 's office can be reached at 512.401.2663 AT AUCTION CLOSE Successful "winning" bidder must telephone 512.401.2663 within 24 hours after the auction has ended to verify purchase and make arrangements to complete the transaction. Within (4) business days of the end of auction, full payment must be received either by cashiers-check, approved bank draft, or certified funds. If funds are not received, and an alternate arrangement has not been made, the vehicle can and will be made available to other potential buyers on a first-come, first-serve basis. OUR GUARANTEE We have disclosed as much information as possible about this vehicle and aim to only carry quality pre-owned merchandise. recommends all vehicles be inspected BEFORE leaving our facility. If upon personal and/or authorized professional inspection of the eBay purchased vehicle at our facility, buyer finds a substantial discrepancy between the published report and actual vehicle, we will either correct the problem at no charge, or work out a compromise, or refund all monies paid. Buyer will not be responsible for any eBay related fees and will be dismissed from any contractual obligation with eBay to purchase the vehicle if and only if inspection proves vastly different from published advertisement. SHIPPING - TRANSPORT OF VEHICLE Returns are allowed in the event the vehicle is shipped and you are dissatisfied. However, a 10% restocking fee applies and the return must take place within 7 days from receipt and the vehicle must have fewer than 200 miles difference upon return. Return shipping fees are the obligation of the buyer. values your business! We want you to be completely satisfied with your online automotive experience from purchase to delivery. Please understand that will arrange shipping for you as a value added service only. We are NOT the shipping company. All shipping questions and/or concerns should be addressed directly with the shipping company used to transport said vehicle. Should you be unsatisfied with your shipping service, please let us know! We aim to recommend only quality vendors. ACCEPTED FORMS OF PAYMENT accepts cashiers’ checks, certified funds, or verified drafts from known/approved financial institutions. We also accept payment from online lenders Capital One Auto Finance, and eBay Finance. All buyers pay a $100.00 administrative fee plus a $50.00 documentary fee. Texas buyers must pay 6.25% sales tax plus applicable Texas fees. Out-of-state buyers are responsible for their own taxes, registration, etc. in their own states. DISCLAIMER All vehicles are sold "as-is" and without warranty. Some vehicles will have factory warranty remaining (will be stated in our description). All cars come with one master key unless otherwise stated. Vehicles come with books and/or manuals only if pictured in photo gallery and/or if stated in the advertisement. * We make every effort to present information that is accurate. However, it is based on data provided by the vehicle VIN decoding and/or other sources and therefore exact configuration, color, specifications & accessories should be used as a guide only and are not guaranteed. Under no circumstances will we be liable for any inaccuracies, claims or losses of any nature. Furthermore, inventory is subject to prior sale and prices are subject to change without notice. Prices do not include taxes, registration fees, finance and/or documentation charges, or shipping fees. To ensure your complete satisfaction, please verify accuracy prior to purchase. ** also offers and recommends affordable extended warranties, please call us for more details. ** Online Bidders are entering into a legal and binding contract to purchase the vehicle described above. If you do not intend to purchase this item, DO NOT BID! Ad created by eCarList.com. Call 214-722-8200 to find out how eCarList can service your dealership. 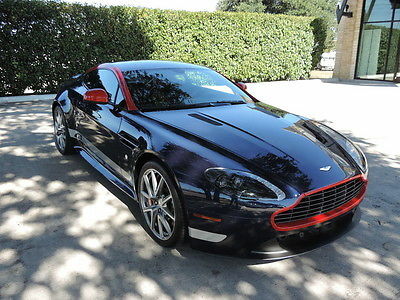 Photo Viewer 2015 Aston Martin V8 Vantage GT GT ASK SELLER QUESTION Vital Information Year Make Model Mileage Engine 2015 Aston Martin V8 Vantage GT GT 5,852 4.7L V8 32-Valve DOHC Engine Exterior Interior Stock# VIN Mariana Blue Dark Gray #A15-42 SCFEBBAL4FGC18600 view window sticker View All Photos Description 2015 Aston Martin V8 Vantage GT GT Very rare Vantage GT finished in Mariana Blue with Red Graphics. The Graphics commemorate the International GT-4 Racing Series. This is a very well equipped GT with an original MSRP OF 116,305.00. Don't let this rare piece of Aston Martin History pass you by! Call today! 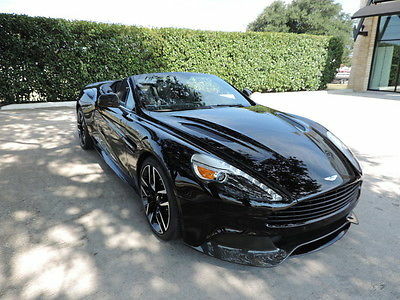 512-401-2663 Contact Us Dealer Contact Aston, Bentley, Lotus of Austin Optional Equipment WHEELS: 19" V-SPOKE GRAPHITE DIAMOND TURNED[WM58]Cost: $1595.00Details:Aluminum WheelsMEMORY SEATS[MS01]Cost: $750.00Details:Seat MemoryMirror MemoryCLEAR REAR LAMPS[TLP2]Cost: $750.00GT Graphics package CARBON-FIBER FASCIA TRIM[VR23]Cost: $1595.00DARK GRAY, ALCANTARA/LEATHER SEAT TRIM[DK-1]Details:Leather SeatsPremium Synthetic SeatsTRANSMISSION: 6-SPEED MANUAL (STD)[-STDTN]Details:Transmission w/Dual Shift ModeA/T6-Speed A/TFront Parking Sensors ASTON MARTIN 700W PREMIUM AUDIO W/DOLBY LOGIC II[AU05]Cost: $1595.00Details:Premium Sound SystemTechnology PackRED BRAKE CALIPERS *PRICE TO FOLLOW*[CB02]MARIANA BLUE[MBL] Standard Equipment ENTERTAINMENT 13 Bang & Olufsen Speakers Radio w/Clock Window Grid Antenna Radio: AM/FM/MP3 Audio System w/6 CD -inc: satellite radio, internal HD navigation system w/full map and voice and 6 speakers 1 LCD Monitor In The Front Bang & Olufsen BeoSound 1000W Sound System -inc: satellite radio, internal HD navigation system w/full map and voice and 6 speakers Radio w/Clock and Voice Activation Bluetooth Wireless Phone Connectivity 6 Speakers EXTERIOR Fixed Rear Window w/Defroster Aluminum Side Windows Trim Tailgate/Rear Door Lock Included w/Power Door Locks Lip Spoiler Colored Power Heated Side Mirrors w/Power Folding Liftgate Rear Cargo Access Body-Colored Door Handles LED Brakelights Wheels: 19" x 8.5 Fr & 19" x 10 Rr 10-Spoke Graphite Clearcoat Paint w/Stripe Light Tinted Glass Black Grille Body-Colored Front Bumper Tires: P245/40ZR19 Fr & P285/35ZR19 Rr Bridgestone Potenza RE050 Fully Automatic Projector Beam High Intensity Low Beam Auto-Leveling Headlamps w/Washer and Delay-Off Galvanized Steel/Aluminum/Composite Panels Rain Detecting Variable Intermittent Wipers w/Heated Jets Wheels: 19" x 8.5J Fr & 19" x 10J Rr Aluminum Spare Wheel Body-Colored Rear Bumper Compact Spare Tire Mounted Inside INTERIOR Sport Alcantara Simulated Suede Steering Wheel Alcantara/Leather Seat Trim Leather Gear Shift Knob Perimeter Alarm Automatic Air Conditioning Analog Display Outside Temp Gauge Integrated Navigation System Full Floor Console w/Covered Storage and 2 12V DC Power Outlets Systems Monitor Engine Immobilizer Power Sport Bucket Seats Front Cupholder Remote Releases -Inc: Power Trunk/Hatch and Power Fuel Seats w/Leather Back Material Fixed Rear Windows Power Racing Seats -inc: 10-way height, lumbar and tilt Front Center Armrest Day-Night Auto-Dimming Rearview Mirror Redundant Digital Speedometer Full Alcantara Simulated Suede Headliner Trip Computer Garage Door Transmitter Fixed Front Head Restraints Driver Foot Rest Alcantara Simulated Suede Door Trim Insert Driver And Passenger Door Bins Power 1st Row Windows w/Driver And Passenger 1-Touch Down Illuminated Locking Glove Box Gauges -inc: Speedometer, Odometer, Engine Coolant Temp, Tachometer, Trip Odometer and Trip Computer Interior Trim -inc: Carbon Fiber Instrument Panel Insert, Carbon Fiber Door Panel Insert, Piano Black Console Insert, Piano Black Interior Accents and Simulated Suede Upholstered Dashboard Front Map Lights Carpet Floor Trim and Carpet Trunk Lid/Rear Cargo Door Trim 2 Person Seating Capacity Full Carpet Floor Covering -inc: Carpet Front Floor Mats Air Filtration Valet Function 2 12V DC Power Outlets Fade-To-Off Interior Lighting Remote Keyless Entry w/Integrated Key Transmitter, 2 Door Curb/Courtesy, Illuminated Entry and Panic Button Power Fuel Flap Locking Type Manual Tilt/Telescoping Steering Column Folding Cargo Cover FOB Controls -inc: Trunk/Hatch/Tailgate Power Door Locks w/Autolock Feature MECHANICAL Mechanical Limited Slip Differential Double Wishbone Front Suspension w/Coil Springs Dual Stainless Steel Exhaust w/Polished Tailpipe Finisher 21.1 Gal. Fuel Tank Premium Shock Absorbers Rear-Wheel Drive Engine: 4.7L V8 32-Valve DOHC Front And Rear Anti-Roll Bars Transmission: 6-Speed Manual Sport Tuned Suspension 4-Wheel Disc Brakes w/4-Wheel ABS, Front And Rear Vented Discs, Brake Assist and Hill Hold Control Double Wishbone Rear Suspension w/Coil Springs Dual Stainless Steel Exhaust w/Painted Tailpipe Finisher Hydraulic Power-Assist Speed-Sensing Steering 3.91 Axle Ratio SAFETY Side Impact Beams Rear Camera Rear Parking Sensors ABS And Driveline Traction Control Dual Stage Driver And Passenger Seat-Mounted Side Airbags Outboard Front Lap And Shoulder Safety Belts -inc: Pretensioners Electronic Stability Control (ESC) Dual Stage Driver And Passenger Front Airbags Low Tire Pressure Warning Airbag Occupancy Sensor Secure Online Credit Application Applying for a vehicle loan online is one of the quickest and easiest application methods. Our secure online application form is easy to complete, all you need are a few personal and employment details. Get started now. Late European is a locally operated Austin Texas USA dealership representing Aston Martin, Bentley, Lotus and Rolls-Royce fine automobiles. Owners Ava and Steve Late are long time Austinites with over 50 years of automotive experience. TERMS & CONDITIONS EUROAUSTIN1007 is a registered eBay user name of . is a Texas Dealer operating under Texas License number is located at 12989 Research Blvd Austin, TX78750. 's office can be reached at 512.401.2663 AT AUCTION CLOSE Successful "winning" bidder must telephone 512.401.2663 within 24 hours after the auction has ended to verify purchase and make arrangements to complete the transaction. Within (4) business days of the end of auction, full payment must be received either by cashiers-check, approved bank draft, or certified funds. If funds are not received, and an alternate arrangement has not been made, the vehicle can and will be made available to other potential buyers on a first-come, first-serve basis. OUR GUARANTEE We have disclosed as much information as possible about this vehicle and aim to only carry quality pre-owned merchandise. recommends all vehicles be inspected BEFORE leaving our facility. If upon personal and/or authorized professional inspection of the eBay purchased vehicle at our facility, buyer finds a substantial discrepancy between the published report and actual vehicle, we will either correct the problem at no charge, or work out a compromise, or refund all monies paid. Buyer will not be responsible for any eBay related fees and will be dismissed from any contractual obligation with eBay to purchase the vehicle if and only if inspection proves vastly different from published advertisement. SHIPPING - TRANSPORT OF VEHICLE Returns are allowed in the event the vehicle is shipped and you are dissatisfied. However, a 10% restocking fee applies and the return must take place within 7 days from receipt and the vehicle must have fewer than 200 miles difference upon return. Return shipping fees are the obligation of the buyer. values your business! We want you to be completely satisfied with your online automotive experience from purchase to delivery. Please understand that will arrange shipping for you as a value added service only. We are NOT the shipping company. All shipping questions and/or concerns should be addressed directly with the shipping company used to transport said vehicle. Should you be unsatisfied with your shipping service, please let us know! We aim to recommend only quality vendors. ACCEPTED FORMS OF PAYMENT accepts cashiers’ checks, certified funds, or verified drafts from known/approved financial institutions. We also accept payment from online lenders Capital One Auto Finance, and eBay Finance. All buyers pay a $100.00 administrative fee plus a $50.00 documentary fee. Texas buyers must pay 6.25% sales tax plus applicable Texas fees. Out-of-state buyers are responsible for their own taxes, registration, etc. in their own states. DISCLAIMER All vehicles are sold "as-is" and without warranty. Some vehicles will have factory warranty remaining (will be stated in our description). All cars come with one master key unless otherwise stated. Vehicles come with books and/or manuals only if pictured in photo gallery and/or if stated in the advertisement. * We make every effort to present information that is accurate. However, it is based on data provided by the vehicle VIN decoding and/or other sources and therefore exact configuration, color, specifications & accessories should be used as a guide only and are not guaranteed. Under no circumstances will we be liable for any inaccuracies, claims or losses of any nature. Furthermore, inventory is subject to prior sale and prices are subject to change without notice. Prices do not include taxes, registration fees, finance and/or documentation charges, or shipping fees. To ensure your complete satisfaction, please verify accuracy prior to purchase. ** also offers and recommends affordable extended warranties, please call us for more details. ** Online Bidders are entering into a legal and binding contract to purchase the vehicle described above. If you do not intend to purchase this item, DO NOT BID! Ad created by eCarList.com. Call 214-722-8200 to find out how eCarList can service your dealership. 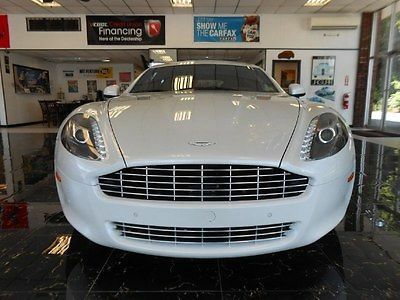 Photo Viewer 2015 Aston Martin Rapide S ASK SELLER QUESTION Vital Information Year Make Model Mileage Engine 2015 Aston Martin Rapide S 620 6.0L V12 DOHC Engine Exterior Interior Stock# VIN Tempest Blue Blue Haze/Creme truffle #P1205 SCFHMDBS7FGF04871 view window sticker Carfax Highlights View Carfax Report Not all accidents or other issues are reported to CARFAX. The number of owners is estimated. See the full CARFAX Report for additional information and glossary of terms. Carfax Highlights No Accidents / Damage Reported to CARFAXNo Airbag Deployment Reported to CARFAXVehicle Qualifies for the CARFAX Buyback GuaranteeNo Structural/Frame Damage Reported to CARFAXNo Manufacturer Recalls Reported to CARFAXNo Indication of an Odometer RollbackCARFAX 1-OwnerNo Total Loss Reported to CARFAX View All Photos Contact Us Dealer Contact Aston, Bentley, Lotus of Austin Carfax Standard Equipment ENTERTAINMENT Bluetooth Wireless Phone Connectivity Radio: AM/FM w/CD/MP3 Player -inc: satellite radio and color screen 15 Bang & Olufsen Speakers 1000w Premium Amplifier Window Grid Antenna Radio w/Clock and Speed Compensated Volume Control 1 LCD Monitor In The Front Radio w/MP3 Player, Clock, Speed Compensated Volume Control, Aux Audio Input Jack and External Memory Control Automatic Equalizer Digital Signal Processor Wireless Streaming EXTERIOR Aluminum Grille Body-Colored Front Bumper Composite/Aluminum Panels Lip Spoiler LED Brakelights Body-Colored Power Heated Side Mirrors w/Power Folding Trunk Rear Cargo Access Fully Automatic Projector Beam High Intensity Low/High Beam Auto-Leveling Headlamps w/Washer and Delay-Off Clearcoat Paint Speed Sensitive Rain Detecting Variable Intermittent Wipers Tires: P245/40R20 Front & P295/35R20 Rear -inc: Bridgestone Potenza Aluminum Bodyside Moldings Compact Spare Tire Mounted Inside Body-Colored Rear Bumper Light Tinted Glass Tailgate/Rear Door Lock Included w/Power Door Locks Laminated Glass Aluminum Side Windows Trim Rear Fog Lamps Wheels: 20" Multi-Spoke Silver Alloy -inc: Diamond-turned finish Body-Colored Door Handles Fixed Rear Window w/Defroster Aluminum Spare Wheel INTERIOR Sport Front Seats w/Power 2-Way Driver Lumbar Driver Foot Rest Rear HVAC w/Separate Controls Gauges -inc: Speedometer, Odometer, Engine Coolant Temp, Tachometer, Trip Odometer and Trip Computer Leather Steering Wheel Front Cupholder Front And Rear Map Lights Cargo Features -inc: Cargo Partition Fixed Front Head Restraints and Fixed Rear Head Restraints Full Alcantara Simulated Suede Headliner Cargo Space Lights Cruise Control w/Steering Wheel Controls 8-Way Power Passenger Seat -inc: Power Recline, Height Adjustment, Fore/Aft Movement, Cushion Tilt and Power 2-Way Lumbar Support Day-Night Auto-Dimming Rearview Mirror Trip Computer Full Floor Console w/Covered Storage, Rear Console w/Storage and 1 12V DC Power Outlet Leather Seat Trim Fade-To-Off Interior Lighting Rear Cupholder Carpet Floor Trim and Carpet Trunk Lid/Rear Cargo Door Trim 4 Person Seating Capacity Leather Door Trim Insert Remote Keyless Entry w/4 Door Curb/Courtesy, Illuminated Entry and Illuminated Ignition Switch Compass Power Rear Windows Valet Function Analog Display Engine Immobilizer Heated Sport Bucket Seats -inc: 10-way power, memorized height, memorized lumbar and memorized tilt Rigid Cargo Cover Interior Trim -inc: Genuine Wood/Metal-Look Instrument Panel Insert, Metal-Look Door Panel Insert, Leather/Metal-Look Console Insert, Metal-Look Interior Accents and Leather Upholstered Dashboard Front Center Armrest w/Storage FOB Controls -inc: Trunk/Hatch/Tailgate Garage Door Transmitter Power 1st Row Windows HVAC -inc: Console Ducts Automatic Air Conditioning Illuminated Glove Box Memory Settings -inc: Driver And Passenger Seats and Door Mirrors Remote Releases -Inc: Power Trunk/Hatch and Power Fuel Integrated Navigation System Bucket Folding Bucket Front Facing Heated Fold Forward Seatback Rear Seat Redundant Digital Speedometer 2 Seatback Storage Pockets Perimeter Alarm Air Filtration Door Mirrors Driver / Passenger And Rear Door Bins 8-Way Power Driver Seat -inc: Power Recline, Height Adjustment, Fore/Aft Movement, Cushion Tilt and Power 2-Way Lumbar Support Systems Monitor Outside Temp Gauge Full Carpet Floor Covering -inc: Carpet Front And Rear Floor Mats Driver And Passenger Heated-Cushion, Driver And Passenger Heated-Seatback Manual Tilt/Telescoping Steering Column 1 12V DC Power Outlet Power Door Locks w/Autolock Feature MECHANICAL Engine Oil Cooler Automatic w/Driver Control Ride Control Sport Tuned Adaptive Suspension Transmission: Touchtronic III 8-Speed Automatic -inc: electronic shift-by-wire control system Rear-Wheel Drive Dual Stainless Steel Exhaust w/Chrome Tailpipe Finisher Battery w/Run Down Protection Front And Rear Anti-Roll Bars 5313# Gvwr 2.73 Axle Ratio Double Wishbone Rear Suspension w/Coil Springs 4-Wheel Disc Brakes w/4-Wheel ABS, Front And Rear Vented Discs, Brake Assist and Electric Parking Brake Cell Phone Pre-Wiring Double Wishbone Front Suspension w/Coil Springs Engine: 6.0L V12 DOHC Hydraulic Power-Assist Speed-Sensing Steering Transmission w/Driver Selectable Mode and Sequential Shift Control w/Steering Wheel Controls 23.9 Gal. Fuel Tank Bilstein Brand Name Shock Absorbers Mechanical Limited Slip Differential SAFETY Airbag Occupancy Sensor Dual Stage Driver And Passenger Seat-Mounted Side Airbags Front And Rear Parking Sensors Dual Stage Driver And Passenger Front Airbags Electronic Stability Control (ESC) Curtain 1st And 2nd Row Airbags Outboard Front Lap And Shoulder Safety Belts -inc: Pretensioners Tire Specific Low Tire Pressure Warning Rear Child Safety Locks Side Impact Beams ABS And Driveline Traction Control Secure Online Credit Application Applying for a vehicle loan online is one of the quickest and easiest application methods. Our secure online application form is easy to complete, all you need are a few personal and employment details. Get started now. 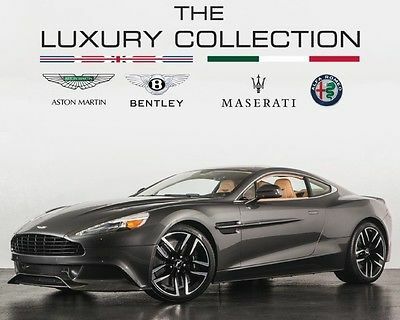 Late European is a locally operated Austin Texas USA dealership representing Aston Martin, Bentley, Lotus and Rolls-Royce fine automobiles. Owners Ava and Steve Late are long time Austinites with over 50 years of automotive experience. TERMS & CONDITIONS EUROAUSTIN1007 is a registered eBay user name of . is a Texas Dealer operating under Texas License number is located at 12989 Research Blvd Austin, TX78750. 's office can be reached at 512.401.2663 AT AUCTION CLOSE Successful "winning" bidder must telephone 512.401.2663 within 24 hours after the auction has ended to verify purchase and make arrangements to complete the transaction. Within (4) business days of the end of auction, full payment must be received either by cashiers-check, approved bank draft, or certified funds. If funds are not received, and an alternate arrangement has not been made, the vehicle can and will be made available to other potential buyers on a first-come, first-serve basis. OUR GUARANTEE We have disclosed as much information as possible about this vehicle and aim to only carry quality pre-owned merchandise. recommends all vehicles be inspected BEFORE leaving our facility. If upon personal and/or authorized professional inspection of the eBay purchased vehicle at our facility, buyer finds a substantial discrepancy between the published report and actual vehicle, we will either correct the problem at no charge, or work out a compromise, or refund all monies paid. Buyer will not be responsible for any eBay related fees and will be dismissed from any contractual obligation with eBay to purchase the vehicle if and only if inspection proves vastly different from published advertisement. SHIPPING - TRANSPORT OF VEHICLE Returns are allowed in the event the vehicle is shipped and you are dissatisfied. However, a 10% restocking fee applies and the return must take place within 7 days from receipt and the vehicle must have fewer than 200 miles difference upon return. Return shipping fees are the obligation of the buyer. values your business! We want you to be completely satisfied with your online automotive experience from purchase to delivery. Please understand that will arrange shipping for you as a value added service only. We are NOT the shipping company. All shipping questions and/or concerns should be addressed directly with the shipping company used to transport said vehicle. Should you be unsatisfied with your shipping service, please let us know! We aim to recommend only quality vendors. ACCEPTED FORMS OF PAYMENT accepts cashiers’ checks, certified funds, or verified drafts from known/approved financial institutions. We also accept payment from online lenders Capital One Auto Finance, and eBay Finance. All buyers pay a $100.00 administrative fee plus a $50.00 documentary fee. Texas buyers must pay 6.25% sales tax plus applicable Texas fees. Out-of-state buyers are responsible for their own taxes, registration, etc. in their own states. DISCLAIMER All vehicles are sold "as-is" and without warranty. Some vehicles will have factory warranty remaining (will be stated in our description). All cars come with one master key unless otherwise stated. Vehicles come with books and/or manuals only if pictured in photo gallery and/or if stated in the advertisement. * We make every effort to present information that is accurate. However, it is based on data provided by the vehicle VIN decoding and/or other sources and therefore exact configuration, color, specifications & accessories should be used as a guide only and are not guaranteed. Under no circumstances will we be liable for any inaccuracies, claims or losses of any nature. Furthermore, inventory is subject to prior sale and prices are subject to change without notice. Prices do not include taxes, registration fees, finance and/or documentation charges, or shipping fees. To ensure your complete satisfaction, please verify accuracy prior to purchase. ** also offers and recommends affordable extended warranties, please call us for more details. ** Online Bidders are entering into a legal and binding contract to purchase the vehicle described above. If you do not intend to purchase this item, DO NOT BID! Ad created by eCarList.com. Call 214-722-8200 to find out how eCarList can service your dealership. 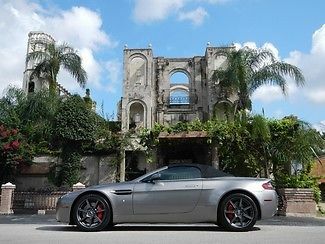 Photo Viewer 2016 Aston Martin V8 Vantage S Roadster ASK SELLER QUESTION Vital Information Year Make Model Mileage Engine 2016 Aston Martin V8 Vantage S Roadster 19 4.7 DOHC 430 HP V8 Exterior Interior Stock# VIN Ceramic Grey Metallic Obsidian Black Leather #A16-06 SCFEKBEL9GGD20194 view window sticker View All Photos Description 2016 Aston Martin V8 Vantage S Roadster When this Vantage S Roadster was ordered, we knew it was going to be the last "S" that we would be able to receive. What is more fitting than to order a one of a kind Roadster? Well...here it is!!! Beautiful, Magnificent, Work of Art, are just some of the many to describe this One Of A Kind Aston Matin See is believing! Call today! 512-401-2663 Contact Us Dealer Contact Aston, Bentley, Lotus of Austin Secure Online Credit Application Applying for a vehicle loan online is one of the quickest and easiest application methods. Our secure online application form is easy to complete, all you need are a few personal and employment details. Get started now. Late European is a locally operated Austin Texas USA dealership representing Aston Martin, Bentley, Lotus and Rolls-Royce fine automobiles. Owners Ava and Steve Late are long time Austinites with over 50 years of automotive experience. TERMS & CONDITIONS EUROAUSTIN1007 is a registered eBay user name of . is a Texas Dealer operating under Texas License number is located at 12989 Research Blvd Austin, TX78750. 's office can be reached at 512.401.2663 AT AUCTION CLOSE Successful "winning" bidder must telephone 512.401.2663 within 24 hours after the auction has ended to verify purchase and make arrangements to complete the transaction. Within (4) business days of the end of auction, full payment must be received either by cashiers-check, approved bank draft, or certified funds. If funds are not received, and an alternate arrangement has not been made, the vehicle can and will be made available to other potential buyers on a first-come, first-serve basis. OUR GUARANTEE We have disclosed as much information as possible about this vehicle and aim to only carry quality pre-owned merchandise. recommends all vehicles be inspected BEFORE leaving our facility. If upon personal and/or authorized professional inspection of the eBay purchased vehicle at our facility, buyer finds a substantial discrepancy between the published report and actual vehicle, we will either correct the problem at no charge, or work out a compromise, or refund all monies paid. Buyer will not be responsible for any eBay related fees and will be dismissed from any contractual obligation with eBay to purchase the vehicle if and only if inspection proves vastly different from published advertisement. SHIPPING - TRANSPORT OF VEHICLE Returns are allowed in the event the vehicle is shipped and you are dissatisfied. However, a 10% restocking fee applies and the return must take place within 7 days from receipt and the vehicle must have fewer than 200 miles difference upon return. Return shipping fees are the obligation of the buyer. values your business! We want you to be completely satisfied with your online automotive experience from purchase to delivery. Please understand that will arrange shipping for you as a value added service only. We are NOT the shipping company. All shipping questions and/or concerns should be addressed directly with the shipping company used to transport said vehicle. Should you be unsatisfied with your shipping service, please let us know! We aim to recommend only quality vendors. ACCEPTED FORMS OF PAYMENT accepts cashiers’ checks, certified funds, or verified drafts from known/approved financial institutions. We also accept payment from online lenders Capital One Auto Finance, and eBay Finance. All buyers pay a $100.00 administrative fee plus a $50.00 documentary fee. Texas buyers must pay 6.25% sales tax plus applicable Texas fees. Out-of-state buyers are responsible for their own taxes, registration, etc. in their own states. DISCLAIMER All vehicles are sold "as-is" and without warranty. Some vehicles will have factory warranty remaining (will be stated in our description). All cars come with one master key unless otherwise stated. Vehicles come with books and/or manuals only if pictured in photo gallery and/or if stated in the advertisement. * We make every effort to present information that is accurate. However, it is based on data provided by the vehicle VIN decoding and/or other sources and therefore exact configuration, color, specifications & accessories should be used as a guide only and are not guaranteed. Under no circumstances will we be liable for any inaccuracies, claims or losses of any nature. Furthermore, inventory is subject to prior sale and prices are subject to change without notice. Prices do not include taxes, registration fees, finance and/or documentation charges, or shipping fees. To ensure your complete satisfaction, please verify accuracy prior to purchase. ** also offers and recommends affordable extended warranties, please call us for more details. ** Online Bidders are entering into a legal and binding contract to purchase the vehicle described above. If you do not intend to purchase this item, DO NOT BID! Ad created by eCarList.com. Call 214-722-8200 to find out how eCarList can service your dealership. 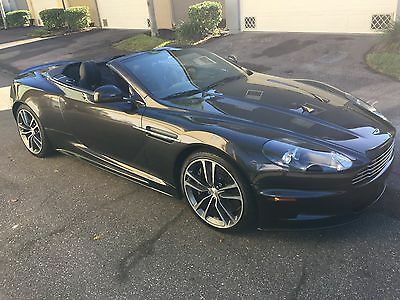 Photo Viewer 2016 Aston Martin Vanquish Volante ASK SELLER QUESTION Vital Information Year Make Model Mileage Engine 2016 Aston Martin Vanquish Volante 18 6.0 DOHC 48 VALVE DOHC V12 Exterior Interior Stock# VIN Onyx Black Metallic All Pure Black Semi Aniline Leather #A16-03 SCFPMCGUXGGK02599 view window sticker View All Photos Description 2016 Aston Martin Vanquish Volante Very sinister Black over black Vanquish Volante. Extremely well optioned and just sooo beautiful!! This is a genuine show stopper! James Bond, would give up his license to kill for this Vanquish! See it today! Call 512-401-2663 Contact Us Dealer Contact Aston, Bentley, Lotus of Austin Secure Online Credit Application Applying for a vehicle loan online is one of the quickest and easiest application methods. Our secure online application form is easy to complete, all you need are a few personal and employment details. Get started now. Late European is a locally operated Austin Texas USA dealership representing Aston Martin, Bentley, Lotus and Rolls-Royce fine automobiles. Owners Ava and Steve Late are long time Austinites with over 50 years of automotive experience. TERMS & CONDITIONS EUROAUSTIN1007 is a registered eBay user name of . is a Texas Dealer operating under Texas License number is located at 12989 Research Blvd Austin, TX78750. 's office can be reached at 512.401.2663 AT AUCTION CLOSE Successful "winning" bidder must telephone 512.401.2663 within 24 hours after the auction has ended to verify purchase and make arrangements to complete the transaction. Within (4) business days of the end of auction, full payment must be received either by cashiers-check, approved bank draft, or certified funds. If funds are not received, and an alternate arrangement has not been made, the vehicle can and will be made available to other potential buyers on a first-come, first-serve basis. OUR GUARANTEE We have disclosed as much information as possible about this vehicle and aim to only carry quality pre-owned merchandise. recommends all vehicles be inspected BEFORE leaving our facility. If upon personal and/or authorized professional inspection of the eBay purchased vehicle at our facility, buyer finds a substantial discrepancy between the published report and actual vehicle, we will either correct the problem at no charge, or work out a compromise, or refund all monies paid. Buyer will not be responsible for any eBay related fees and will be dismissed from any contractual obligation with eBay to purchase the vehicle if and only if inspection proves vastly different from published advertisement. SHIPPING - TRANSPORT OF VEHICLE Returns are allowed in the event the vehicle is shipped and you are dissatisfied. However, a 10% restocking fee applies and the return must take place within 7 days from receipt and the vehicle must have fewer than 200 miles difference upon return. Return shipping fees are the obligation of the buyer. values your business! We want you to be completely satisfied with your online automotive experience from purchase to delivery. Please understand that will arrange shipping for you as a value added service only. We are NOT the shipping company. All shipping questions and/or concerns should be addressed directly with the shipping company used to transport said vehicle. Should you be unsatisfied with your shipping service, please let us know! We aim to recommend only quality vendors. ACCEPTED FORMS OF PAYMENT accepts cashiers’ checks, certified funds, or verified drafts from known/approved financial institutions. We also accept payment from online lenders Capital One Auto Finance, and eBay Finance. All buyers pay a $100.00 administrative fee plus a $50.00 documentary fee. Texas buyers must pay 6.25% sales tax plus applicable Texas fees. Out-of-state buyers are responsible for their own taxes, registration, etc. in their own states. DISCLAIMER All vehicles are sold "as-is" and without warranty. Some vehicles will have factory warranty remaining (will be stated in our description). All cars come with one master key unless otherwise stated. Vehicles come with books and/or manuals only if pictured in photo gallery and/or if stated in the advertisement. * We make every effort to present information that is accurate. However, it is based on data provided by the vehicle VIN decoding and/or other sources and therefore exact configuration, color, specifications & accessories should be used as a guide only and are not guaranteed. Under no circumstances will we be liable for any inaccuracies, claims or losses of any nature. Furthermore, inventory is subject to prior sale and prices are subject to change without notice. Prices do not include taxes, registration fees, finance and/or documentation charges, or shipping fees. To ensure your complete satisfaction, please verify accuracy prior to purchase. ** also offers and recommends affordable extended warranties, please call us for more details. ** Online Bidders are entering into a legal and binding contract to purchase the vehicle described above. If you do not intend to purchase this item, DO NOT BID! Ad created by eCarList.com. Call 214-722-8200 to find out how eCarList can service your dealership.